Before I start I have to let you in on the fact that I did not do the work myself. If you are looking for a how to guide on fitting windows for your van conversion, this is not it. 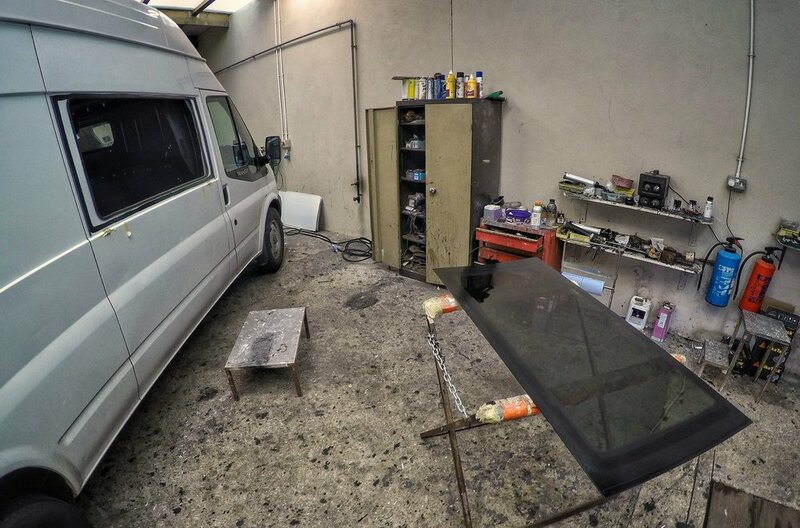 I will however tell my story of getting some professionally fitted, bonded side windows to my Ford Transit Van. The reason for not doing this job myself is due to a lack of suitable workshop locations. I am pretty good at putting my hand to most things and did feel confident that I could do this job without the windows falling out somewhere down the road. I live in England, famed for grey rainy days and recently the weather has been awful for trying to convert a van. So I decided to get the professionals in. After looking online at prices of windows and then the specialist kit for doing a proper job I decided to go get them fitted elsewhere. The price difference wasn't really all that much when you factor in that all I have to do is make a phone call, tell them my vehicle, what style of windows I want and then turn up. The windows I chose are a bonded type. This means they are glued to the outside of the van itself. They do not sit in a frame. And I have gone for the privacy tint which is perfect, just what I wanted. From the outside it is difficult to see in but from the inside you can clearly see out and they let in lots of natural light which is brilliant. Here in the UK you need a side window fitted as part of the criteria for getting the log book (V5 document) changed over to a Motor home from panel van. Definitely recommend getting this done as you will get cheaper insurance and I believe cheaper ferry crossings too. I decided on two windows as I really want as much natural light entering the van as possible. I arrived at the company workshop at 0800. It's a real full day. Straight away they started work hacking at the van panels and getting those holes cut out. I didn't need to be around but I kept popping back because I was interested in how it's done. The part that I would have struggled at was prepping the surface and working with the glue that bonds the glass to the metal. Not that it's anything really technical, just the fact that I don't have the facilities to do a job like this. It was interesting watching them throughout the process. All the work was complete by lunchtime. You now need to wait as long as possible before driving the vehicle so it bonds properly. I was told to give it at least four hours before moving the vehicle. If you're going down this route pick a location that can entertain you for the day. I was in Margate so I spent my day walking along the beach and eating fish and chips. The windows have been fitted for a while now and I've had no problems and I'm really happy that I got this job done. It cost me £375 all in to get both windows fitted which I don't think is too bad when you think about the time, labour and parts. Plus the added peace of mind that it was fitted professionally. I live in Kent in the South East of England and used a company called John Oki and Sons. They are based in Margate. Please do check them out. I was very happy with the service from start to finish. Margate also has one of the best fish and chip shops around. It was so good! Thanks for reading, please do hit that like button below and comment with any questions. It would also make my day if you could stick your email address in the box provided below to receive an occasional update from this website.